Not paper per se, but still I must share this novel silhouette portrait by artist Jenny Lee Fowler, who primarily does traditional paper cuttings. As transient as summer into autumn, there's no guarantee a custom leaf cutting will retain its original appearance, but then isn't that the way with all art? Jenny says it best... "Somehow, it is easy to forget how ephemeral paper is, but a leaf renders the precious and precarious loud and clear." Do you see the shape the veins make? I didn't notice that at first! Have a great weekend and perhaps take a moment to enter the PhotoWeights giveaway if you haven't already - it's a good one! I love that Fowler uses natural material for her silhouettes. I'm curious if some type of preservative might be used so that the leaf does not dry out and crumble. Still, even as something temporary, it's delightful, and I think how charming it would be to have a group of these as placeholders at a dinner, perhaps glued to small paddles. The mysterious book sculptures are fabulous. I've been following them, too. Great fun! So lovely. I loved visiting her shop . her moth leaf looks so pretty . I agree, Maureen - I've read that glycerine works well as a leaf preservative. I just love this silhouette is wonderful I love it! I can't recall if I've told you how much I enjoy reading your blog! I look forward to coming over here each day at some point & seeing if you've posted. There's just something so soothing and calming and - at the same time - exciting about this blog! Thank you for that! I think your personality shines. Thanks for allowing me to 'visit' you daily! ...it's always interesting to see different twists of an age-old craft, whatever it be. Experimenting can sometimes bring up whole new trends. 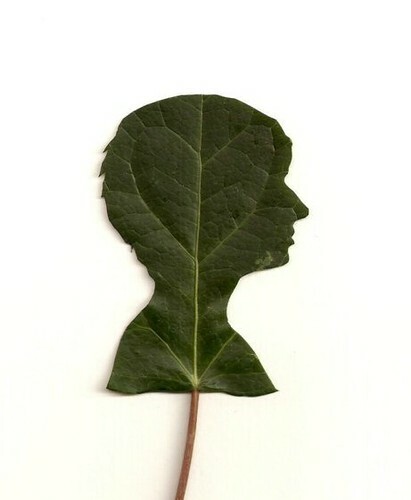 I noticed the heart right away in the leaf. I was thinking you could preserve the leaves by using a flower press. Then I went to look at her things and she mentioned pressing them with the picture frame and keeping it out of sunlight. I can't see how the artist who makes the wonderful altered book pieces will be able to keep his identity secret for very long. He makes such beautiful pieces. So glad you had shared him with us. This is beautiful & unique! Thanks for sharing! So naturally lovely Ann! Thank you for visiting and entering my giveaway! Such lovely comments, everyone - thanks! Thanks for keeping us up to date with the Banksy -style book artist. Cool!!!! I'll have to remember to do something like that one day when Lachlan is older.